Former Nottingham Forest youngster Tom Huddlestone, rejected by the Reds aged 12 and who then went on to Derby County and success in football, has recalled some of his East Midlands Derby memories ahead of Monday’s encounter between the two arch-rivals. 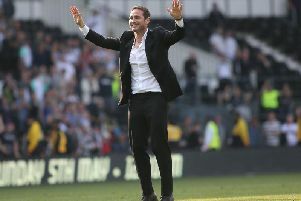 The midfielder had his first taste of an East Midlands derby at the age of 16 as then Derby manager George Burley threw him into action against his hometown club in September 2003. Huddlestone told Rams TV: “I remember it (the 2-2 draw) well. I started right midfield and Lee Holmes got knocked out in the first 15 minutes and I ended up on the left. “It was a hot day and I think we could have nicked it late in the game with Michael Johnson hitting the crossbar. Battles between the sides continued, and later in the 2003/04 season, the infamous ‘Kenco Coffee Cup’ fixture occurred. “I was speaking to Michael Dawson (Forest defender and former team-mate) not long ago about that and I don’t think their goalkeeper really played at Forest again after that, even though he couldn’t do anything about it, but I have some good memories,” Huddlestone, a former Spirs and Hull City star, said. “It was a long time ago, but they are games that I relish and coming back last season was a big part of that. “Everyone knows the general rivalry but on a personal level, being born and raised in Nottingham, my family and friends are Nottingham Forest fans, and looking back now, being let go as a kid makes for a good mix. “As much as you want every game to feel similar, the two against Forest have a bit more significance for me and my family.